Still on photographer Carlo Naya, here is his image of the well-head inside the Palazzo Ducale. I've been reading John Pemble's histiography of Venice, Venice Rediscovered (Oxford University Press, 1996). Pemble notes that in the 19th century, Venetian well-heads had become highly prized by collectors, particularly in Britain. 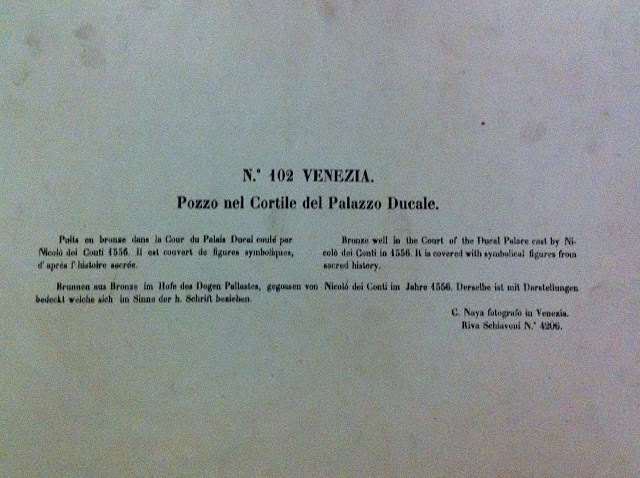 He writes that in 1814, there were 5,000 well-heads in Venice. By 1856 - less than 50 years later - there were only 2,000 well-heads left in the city, and only 17 of these dated from the earliest, Byzantine era. 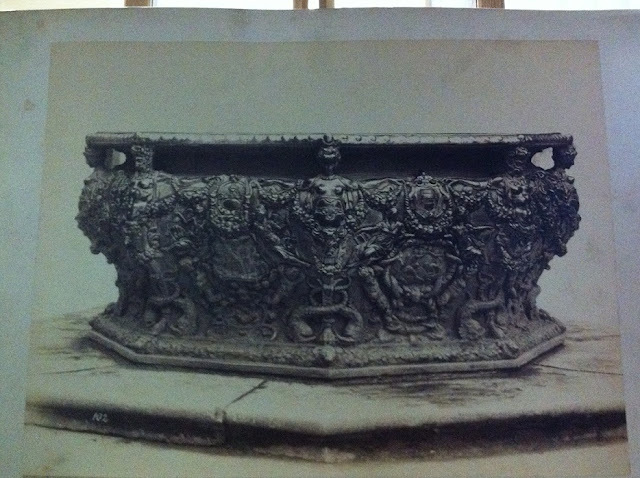 Two of the V & A's Venetian well-heads came from the Cavendish-Bentinck collection from Brownsea Castle on Brownsea Island (the island is now administered by the National Trust). One well-head, dated 1490-1500, had been purchased in Venice in 1882 from a house in the Fondamenta dei Mori where Tintoretto had lived. The other, of red Verona marble, is dated 1425-1430 and was purchased from Venice in 1874 from Palazzo della Zoya near SS Giovanni e Paolo. The museum's notes indicate that a similar well-head is in the courtyard of Ca D'Oro. A third well-head, dating from the 9th century was bought by J.C. Robinson in 1882 from Murano. A fourth well-head dates from around 1450.